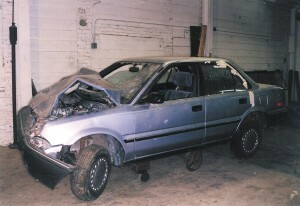 The purpose of a motor vehicle’s restraint system is to lessen an occupant’s risk of injuries in a crash. However, an improperly designed seatbelt may cause greater injury and even death to occupants. A snug fitting lap/shoulder belt ties the occupant directly to the passenger compartment and allows the occupant to “ride down” the crash. This eliminates the more severe occupant to interior “second collision.” Belts are also designed to distribute restrained loads over strong skeletal structures including the shoulders, rib cage, and pelvis to optimize protection during deceleration. 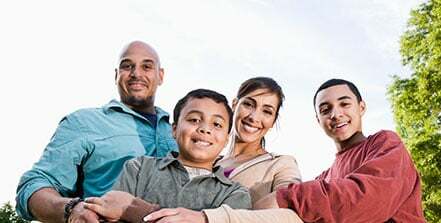 The most common type of auto accident is a frontal collision. 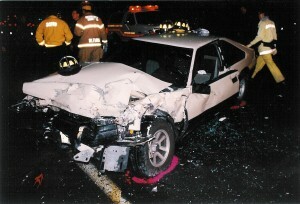 In such collisions, occupants using a lap only belt can “jackknife” over the lap belt. Jackknifing may result in fatal or severe abdominal injuries and/or spinal cord injuries or may cause the victim’s head to strike the front seat or center console resulting in neurologicial injury. A seatbelt system that restrains the upper torso as well as the lower torso, e.g., 3-point belts, provides safer occupant protection than lap only systems. Lap only belt cases often involve children and women since their smaller stature makes them more susceptible to harm from seatbelts that are designed for the specifications of a 50th percentile male anthropomorphic dummy. 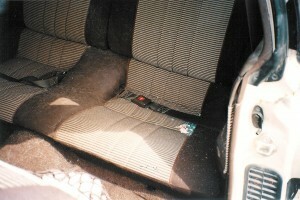 These smaller individuals are often seated in the rear center seat using a lap-only belt when they are injured. The dangers associated with lap-only belts have been known since prior to the early 1960s when the term “seatbelt syndrome” was coined. Since 1988, Federal Motor Vehicle Safety Standard (FMVSS) 208 has required the installation of 3-point belt systems for front and rear outboard seating positions. Additionally, NHTSA also required that all vehicles have 3-point belts for the center rear by 2007. 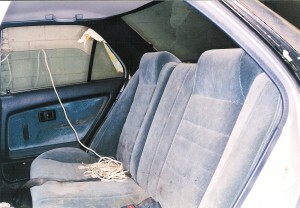 However, there has been no effort to retrofit vehicles with lap-only belts in the center position. Therefore, millions of cars, minivans, light trucks, and SUVs on the road will have lap-only seatbelts in the center rear for many years to come. 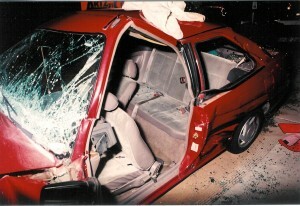 In this frontal impact, the rear middle seat passenger only had a lap belt and suffered severe abdominal injuries. In this frontal impact, the outboard rear seat passenger only had a lap belt and suffered severe abdominal and spine injuries. In this frontal collision, both rear seat passengers had only lap belts and suffered severe abdominal injuries. The location in which seatbelts are anchored to the vehicle may not provide effective restraint in some accidents, including rollovers, because it permits excessive excursion of an occupant in a collision. If improper anchor points create a lack of balance between the upper and lower torso or shoulder belt and lap belt, then even though an occupant of a vehicle is wearing both the lap and shoulder belts, the occupant may suffer serious injuries depending upon where the imbalance lies. If the shoulder belt takes too much force in the collision, the chest or thorax may be injured. If the lap belt takes too much force, then a submarining effect may ensue. Thus, the lap belt and shoulder belt must proportionally distribute force over the occupant’s body. Testing done by the manufacturer may prove critical in establishing this type of defect. c. “Submarining” Under the Seatbelt. “Submarining” occurs when a lap belt rides over the pelvis and penetrates the abdomen. When this occurs, the forces generated in a collision are shifted from the strengthof the pelvis into the weaker abdomen of the occupant. Such occurrences may arise with a lap-only belt or an improperly designed lap/shoulder belt restraint system. NHTSA’s submarining test demonstrates that test dummies wearing lap-only belts experienced substantially higher levels of injurious force to the abdomen, lower spinal cord area, and head than those wearing 3-point lap/shoulder belts. Moreover, submarining may be a result of a manufacturer’s improper anchor point design or improperly designed seat structure. When seatbelt buckles are not equipped with anti-inertial unlatching features, the forces of an accident may cause the seatbelt to become unlatched thereby causing an occupant to become unrestrained. With certain seatbelt designs, the seatbelt may unlatch due to dynamic loading conditions, thus depriving the occupant of the benefits of the vehicle’s seatbelt. 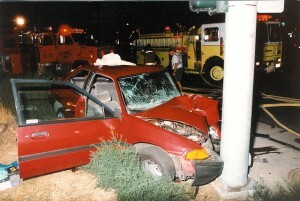 In such cases, evidence demonstrating belt usage, buckle to vehicle contact, or buckle to occupant contact is important. If you have a potential defective seatbelt case that you would like to speak to a lawyer about, either call 414-271-1011 or complete the information below and click submit. You will be contacted by one of our attorneys. What do I look for when buying a new car? Defective takata airbags may cause injury?